Hi! We are the Diviney family and we are here to make your sailing dreams a reality in Hampton Roads. Sailing in the Tidewater area has never been more fun, more affordable, or more enjoyable than with SailTime Virginia Beach. SailTime is conveniently located to serve Norfolk, Richmond, Williamsburg, Virginia Beach, Hampton Roads, the southern Chesapeake Bay, North Carolina and Virginia. Our sailing school is located at Vinings Landing Marine Center at Shore Drive and Pretty Lake Ave. 8166 Shore Drive, Norfolk, VA 23518. Our Fractional Sailboats are located on “C” dock at Bay Point Marina on Little Creek. Whether you are an experienced sailor looking for a great way to get back on the water, or a “landlubber” looking to see what sailing is all about, we’ve got a program that’s right for you! We have fractional sailing memberships available on Beneteau and Jeanneau sailboats. We are looking for new Beneteau and Jeanneau Sailboat Owners. If you are considering buying a boat, call Kristen at 757-663-7245 today to find out about this great opportunity to get out on the water! Our USCG Certified, American Sailing Association Instructors will take you from beginner to advanced, qualifying you to sail increasing sized sailboats along the way. Give a personalized gift certificate for a sailing adventure. Call or register for details. “Discover Sails” only $199. We’ll create a personalized gift certificate just for your special sailor wannabe, and email it to you. Credit cards accepted. 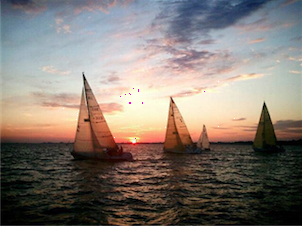 Photo Courtesy of SailTime VB Member Bob L.